In autumn 2013 my kale suddenly developed huge holes in the leaves. I searched for caterpillars but found very few. I did not recognize the caterpillars and could not find them in my trusty “Rodale’s Color Handbook of Garden Insects” (1979). I ignored the problem and unfortunately it did NOT go away. The kale was devastated and I ripped it out before frost. Fast forward to October 2014. My garden held a lot of Brassicas (cabbage family crops), most transplanted into the garden 7/21. Napa cabbage, kohlrabi and cabbage plants were approaching harvestable size. 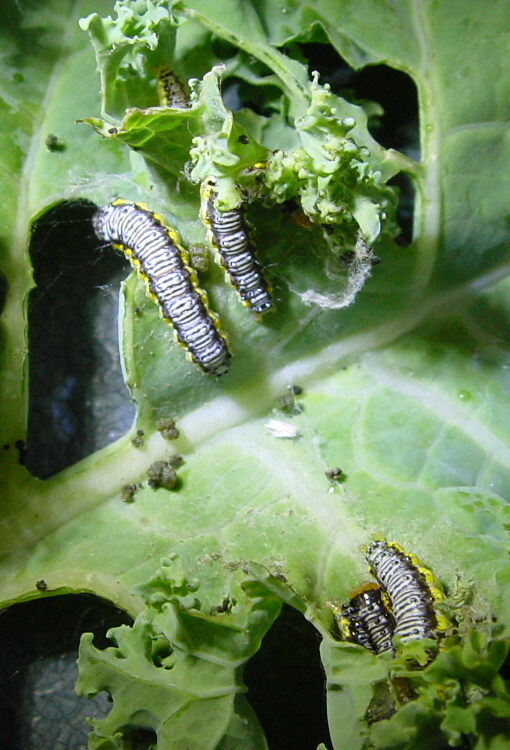 The Brassicas were not protected so I was doing my weekly check for Imported Cabbage Worms. That’s when I noticed the new caterpillar, with its blue-grey back and yellow racing strips down the side. This time I turned to Google with the search terms “blue-grey caterpillar yellow stripe cabbage”. Bingo! The first image was the caterpillar in my garden. The picture provided a name: ‘Cross-striped cabbageworm, Evergistis rimosalis (Lepidoptera) ‘ and Googling the name brought me to the Massachusetts Extension. Up close, in good light, wearing my reading glasses, the cross-stripes are obvious. The adult form of the Cross-striped cabbageworm is a cryptic moth who lays her eggs in packets of 3-25. The packets are yellowish and flattened and attached to the underside of Brassica leaves. After hatching the larvae grow to 3/4” over 2-3 weeks. The masses of caterpillars feed on the underside of the leaves and may not be noticed until they break through the leaf surface and move to the top. By then it is too late. I was able to salvage only the hearts of my Napa cabbage and the kohlrabi bulbs. There are 2-3 generations per year so fall infestations are severe. Apparently this pest has moved north with global warming and is now in southern New England and adjacent areas of NYS. It affects all Brassicas including broccoli, collards and Brussels sprouts in addition to cabbages, kale and kohlrabi. Control methods include hand-picking the egg packets and caterpillars, planting under a floating row cover, or spraying with Bt – Bacillus thuringiensis – a product allowed in organic gardens. Luckily, these are the same techniques used to control our old friend the Imported cabbageworm. With spring plantings I use floating row covers. Unfortunately, my fall plantings are often scattered around the garden, making them difficult to cover. 5/2014 Assorted cabbages protected by tulle. 2014 was my first time using tulle as a row cover. I worried the rough tulle would be abrasive to plant leaves so I used stakes (ski poles free from my neighbor) with several layers of rags tied to the top to hold the tulle above the plants. I liked the tulle because the plants were clearly visible and they let through plenty of light. Tulle may be locally available at fabric and craft store and the price may be right with a coupon. 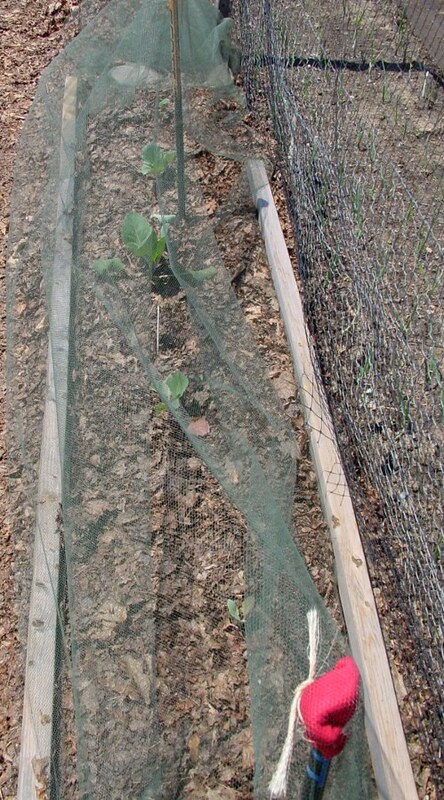 Tulle, like my Agribon floating row cover, slowly degrades in the garden and is good only for a single season. I spent the week harvesting sweet potatoes, one variety a day. Georgia Jets and Purple are the varieties that grow fastest. I checked under their vines a couple of weeks ago and found they were sizing up nicely. 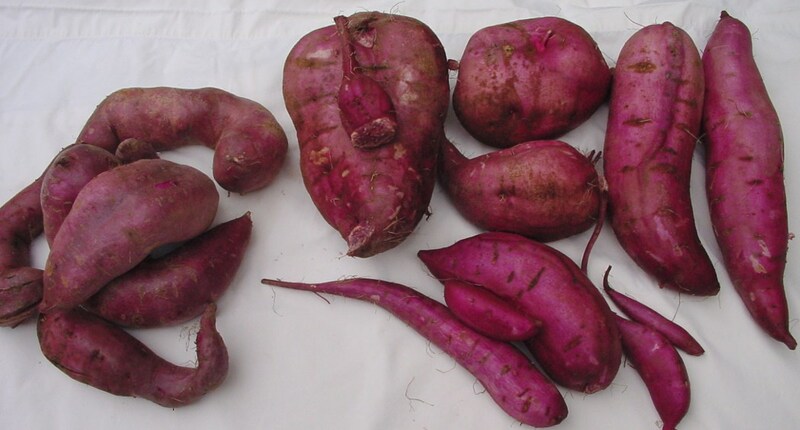 I removed a few Purples which showed me they were big enough that there would be no advantage in delaying harvest and lots of potential for rodent damage if the sweet potatoes were not harvested soon. My sweet potato bed was 4’x13′ with 2 rows of plants spaced 1′ apart. Here are the harvest numbers. Most varieties did better than last year, with the exception of Laceleaf which is even worse than last year. In mid-June I got more plants, extras that were not needed in the gardens at Locust Grove. Three Purple slips went into an empty spot along my fence. Sweet potato vines are aggressive. My neighbor had onions on the other side of the fence but I managed to keep the vines on my side until he pulled his onions. The vines were 3′ into his garden when I started harvesting this morning. Three Purple Sweet Potatoes. They were intertwined in the ground too. 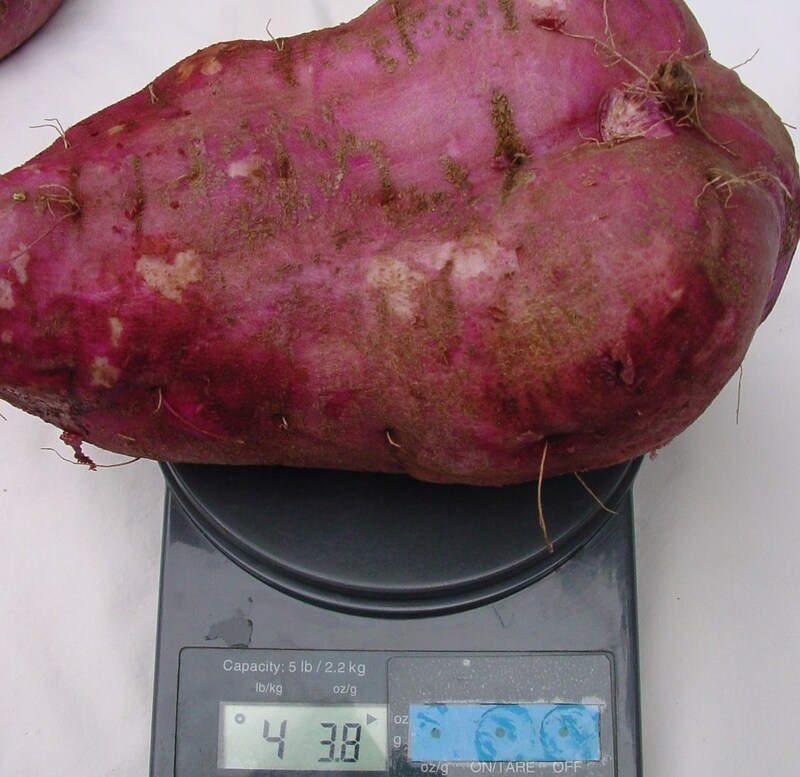 The biggest Purple sweet potato – quite nice looking, no splits or cracks. The entire 19 pounds of Purple Sweet potatoes from the mid-June planting. The three plants from the mid-June planting yielded 19.4 pounds or 6.3 pounds per plant. Phenomenal for a cool-ish summer in the northeast USA. 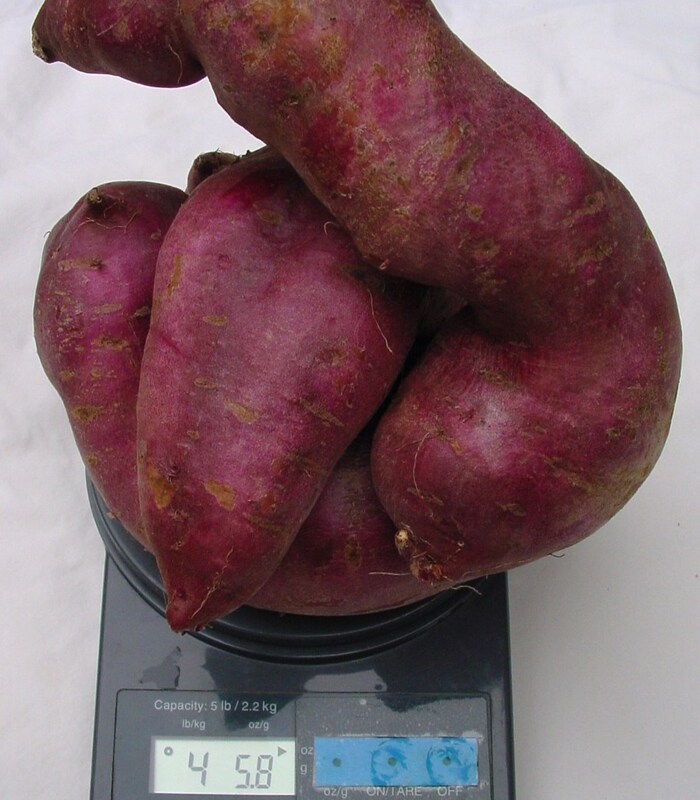 This is what I mean by an ugly sweet potato. It is nicely sized and shaped, but split and cracked plus it has surface damage cause by an animal or insect. All but one of my Georgia Jets have the same damage. They won’t store well. An ugly Georgia Jets sweet potato. All in all, 2014 was an excellent year for sweet potatoes.